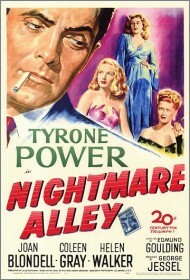 Until it was re-published recently, Nightmare Alley was all but forgotten, its story better known as a famous film noir of 1946 starring Tyrone Power in the role of Stanton Carlisle, an ambitious intelligent young man who falls in with a travelling circus. Stan learns the secret tricks of “mental telepathy” from an old washed-up carnival drunk and seizes his chance to become “The Great Stanton” on stage and in nightclubs. But phoney magic isn’t enough for Stan. With the frightening fatalism of a gambler determined to test his luck to the limit, he begins taking risk after risk. At first it’s just ‘cold reading’ the mugs in the audience, but then he starts gambling with his life and career as well. Maybe he really does have some psychic power that is guiding him? But as he lets go of all normal restraints Stan begins a descent into moral corruption because of the power over others that his “gifts” give him. His fate is sealed when he meets a beautiful but utterly amoral woman psychiatrist – perhaps the most original and frightening villain in literature – who eggs him on to his inevitable destruction. Gresham’s story is curiously alone in literature – its theme and subject matter utterly unique: carnival freaks, human gullibility, the obsession of con-men to gamble against themselves; and the amoral depths to which even the most respectable can sink. The book’s writer, William Lindsay Gresham, served as a volunteer with the loyalist forces in the Spanish Civil War in the 1930s. One of his fellow volunteers was an old carnival hand with whom he held long conversations, soaking up stories. Later, in the 1940s, Gresham worked as an editor for a “true crime” pulp magazine in New York City and it was then that he wrote the novel. In 1946, the year the book was published, actor Tyrone Power, tired of being cast as a heartthrob, was looking for an opportunity to show he could act. He personally bought the screen rights so he could star as the protagonist with a broken moral compass. His intuition about the role was spot on. He and his fellow actors – especially Helen Walker as the crooked psychiatrist – produced a masterpiece. More than any other example of 1940s noir, this film stays with me as transcending its subject and characters to become an epic of human credulity and self-deception. While watching it onscreen, toes curling, I feel as though I am watching a message from the cosmos, rather than a piece of fiction. Gresham later went through a tragic phase as an alcoholic. Unlike his protagonist he managed to reform and later became a born again Christian. He and his wife, Joy, read the works of C S Lewis and started their own Christian organisation in the US. However, in the 1950s, Gresham’s drinking and abuse started up again and his wife left him with their two sons and came to England. Here she met and married C S Lewis – yes, that Joy Gresham.